If only all big budget blockbusters were made by Christopher Nolan. The vast majority of Hollywood’s action packed star vehicles are CGI-heavy, story-light dross where what passes as a plot serves only to link expensive set-piece after expensive set-piece – and, as a result, they are interminably dull. Nolan, however, has realised that movie audiences deserve better. His film’s are well-acted, feature computer generated effects only where there is no alternative and, most importantly, have multi-layered, intelligent narratives which assume a certain intelligence on the part of the audience. It’s an approach which has seen the director’s status rise to almost untouchable status on the back of productions like Memento (reviewed here), The (underrated ) Prestige and his genre re-defining Batman trilogy. Inception is perhaps his finest achievement to date. Dom Cobb (Leonardo Di Caprio) is a thoroughly modern spy. Eschewing normal methods of intelligence gathering, he steals information directly from his subject’s brains. Entering via their dreams, he is an ‘extractor’ – paid big bucks to steal secrets from the subconscious mind. But his skill has come at a price: the loss of his family. So when he a billionaire businessman offers him a route home, he has to do something previously considered impossible: planting an idea in his subject’s mind. This process is known as ‘inception’. Trying to explain the plot much further than that is to do the film a disservice. To spoil the surprises it contains would be a shame – and to articulate in words what happens on screen would be an insult to your intelligence. That’s not to say the story is overly complicated – it’s not. But it does require a degree of patience and a few handy moments of exposition from the cast – notably Ellen Page’s Ariadne. Suffice to say, most of the movie’s action takes place within the world of dreams. Here, time passes more slowly and people can only be woken from their slumber by a ‘kick’ like the one that jolts you awake when you’re falling to sleep. It’s a neat incorporation of something audiences are familiar with as key plot points. For those familiar with myth, legend, psychology and art there are numerous other hints, in-jokes and clues embedded within this rich text – cutest of all being the use of Escher’s paradoxical architectural artwork. It’s not all cerebral, though. There are some excellent action scenes, the best of which is a zero gravity fight in a hotel corridor. In order to film the scene Nolan had a giant replica corridor built and hung from a crane which spun it around its own axis. The action which takes place within this massive structure was choreographed rather than computer generated, creating some authentically meaty hand-to-hand combat. Crunching car chases and a snowy showdown are similarly spectacular. 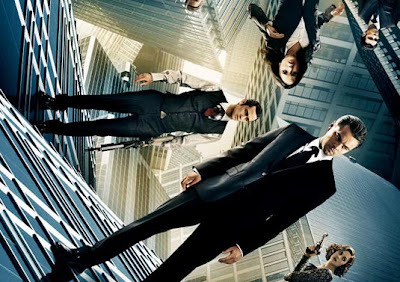 Above all else, however, Inception is a film of ideas. Its huge scope covers life, death, grief, faith, the afterlife (or perhaps limbo? ), love, loss and the nature of man. Whilst very apparent, those themes are worn lightly, meaning that the film can be enjoyed as pure spectacle. And that’s fine. But repeated viewings cause Inception to become more rewarding with every watch. A magnificent and wholly original film.